Clashes continued Saturday night between Tunisian security forces and protestors in Sidi Bou Zid, a city in the centre of the country. The government has recognised the legitimacy of the demands made by the public against high unemployment, but rejected the use of violence. Al Jazeera reported that the clashes persisted overnight between security and the residents of Al-Reqab and Al-Maknassy as riots hit the ninth day. A campaign of night raids by security forces in a number of neighbourhoods is the backdrop to continued riots. 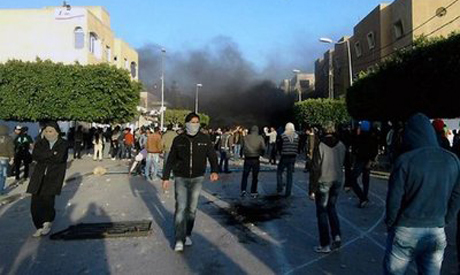 Clashes erupted 17 December in the town of Sidi Bou Zid after a man committed suicide in a protest over unemployment. Five days later, on 22 December, another young man climbed up an electricity pylon and electrocuted himself, saying he was fed up with being unemployed. As of time of writing, the riots have spread to other areas, including the capital city Tunis, in which hundreds of Tunisian citizens demonstrated against high unemployment and to show solidarity with the citizens of Sidi Bou Zid. Protesters, around 500 people, included syndicate members, human rights activists, students and bloggers and raised slogans like "No to tyranny," "Freedom and national dignity," and others related to high prices and employment problems. Security forces brutally attacked protesters to disperse from outside the Tunisian General Labour Union's HQ. Several organizations, opposition parties, and activists have formed a coalition in solidarity with the residents of Sidi Bou Zid. Scenes of riots are new in Tunisia, which has been run for 23 years by Western-aligned President Zine Al-Abidine Ben Ali.